Proud and dignified, with elegant carriage, the Toy Poodle dog breed is intelligent and full of liveliness and perkiness. The Toy Poodle has an athletic history in its genes, having been bred from working retriever stock, and it moves with a springy, effortless gait. The Toy Poodle is eager to please and easy to train. The Toy Poodle originated in Europe. Toy Poodles range from 4 to 8 pounds. Toy Poodles can be any solid color. Toy Poodles have harsh, dense coats. Their coat requires brushing twice a week and clipping every two months. 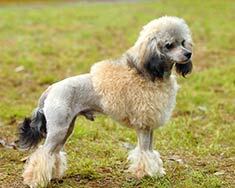 Toy Poodles are a good tempered breed and are devoted to their families. Affectionate with their owners, Toy Poodles can be timid around strangers. 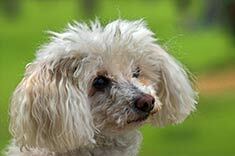 The Toy Poodle is susceptible to patellar luxation, epilepsy, ear infections, eye disease and diabetes. The expected life span of the 12-14 years. Toy Poodles do well in apartments and are good dogs for less active people. One walk a day is fine for this breed. The Toy Poodle is in the Toy group. Find Toy Poodle Puppies with our Free Breeder search!